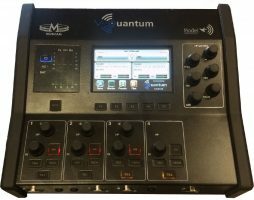 V-Quantum is a powerful Portable Audio Codec with incoming Video stream monitoring and all the technical resources necessary for a successful audio contribution. 1.- Commentary unit, sending its audio inputs to on-site infrastructure like OB-Vans or IBCs using audio-over-IP Dante or AES67 protocols. 2.- Codec mode, acting as an audio mixer and transmitting two audio programs directly to studio using IP networks (up to 4 mono channels). 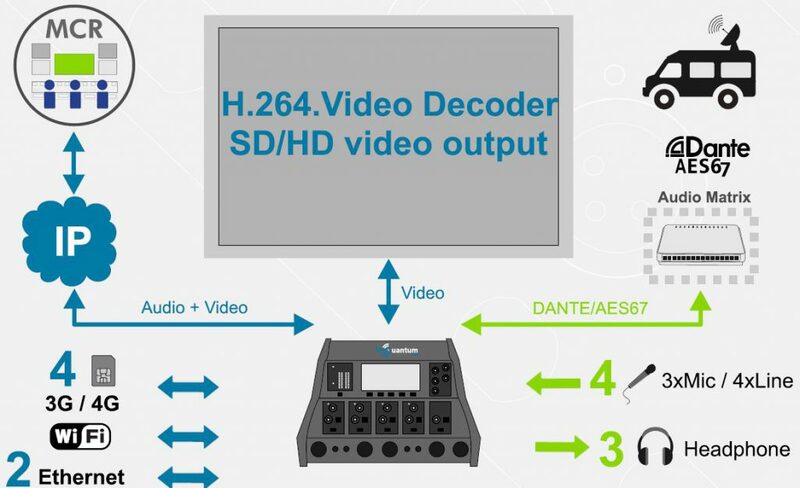 V-Quantum can also decode H.264 incoming video streams. V-Quantum codec inherits world-class IP technology from the Prodys Ikusnet Video Codec Family: Automatic Jitter Buffer, Adaptive Bit rate, Bonding of up to 7 IP links (Ethernet, 3G/4G, Wi-Fi) for secure audio streaming with the best possible audio quality. A Wireless Communication Module is available with up to four 3G/4G data links with bonding capabilities. This module is external for better reception and versatile installation options. Upto 4 mono inputs available for mixing, encoding and transmission transmisión in stereo mode. – Prodys Real time Network Analyzer: to monitor critical network parameters in real time during the connection. 2 x Ethernet interfaces: Either to split streaming and control or for bonding/diversity with 2 IP links. H264 video decoder for the reception of a video IP stream (BRAVE protocol). 2 x Ethernet ports for bonding, diversity or splitting control and audio stream. 2 x RJ45, 10/100/1000BaseTx Ethernet connectors. 1 x Internal modem and 2 x USM modems. External Communications Module. with up to 4 x 3G/4G SIM cards. 2 x contact closure inputs and 2 x relay outputs. Width: 270mm; Height: 88 mm; Depth: 235 mm.